Grammar in Use. Intermediate. Murphy Raymond, Smalzer William. Educational resources of the Internet - English. North American English. Третье издание одного из самых лучших и пользующихся заслуженным признанием преподавателей всего мира учебных пособий для самостоятельного изучения английского от Реймонда Мерфи в в соавторстве Вильямом Смальзером. Важно особенностью книги является ее адаптация под Североамериканский вариант английского языка. Книга рассчитана на обучающихся со средним уровнем подготовки (Intermediate – High intermediate). 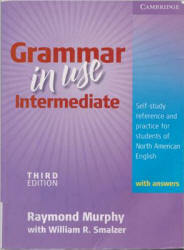 Well known for its simple, clear explanations and two-page format, Grammar in Use Intermediate is a unique combination of reference grammar and practice book for students of North American English It is an excellent resource for students who are preparing for the TOEFL test and other standard examinations. This colorful new edition is fully updated and includes: more practice in every lesson; nine new units, including eight new units on phrasal verbs; more Additional Exercises in the back of the book to give students extra opportunities to consolidate what they have learned. This book includes a complete answer key that makes it suitable for self-study. 12 How long have you (been) . .. ? 13 For and since When . . . ? and How long . ., ? 33 Had better It's time . . .
38 If I had known ... I wish I had known . . .
43 It is said that. . . He is said to . . . He is supposed to . . .
49 Auxiliary Verbs ihave/do/can. etc.) I think so / I hope so, etc. 82 There . . . and It. . .
86 All / all of most / most of no / none of, etc. 117 By and until By the time . . .
Учебные материалы и тематические ссылки по всем предметам и многое другое.